Up to six logs’ worth of extra growth per hectare every year for the entire life of the forest. The bark of a tree contains all the nutrients and micro-organisms of the tree. When trees are stripped of their bark at the factory the nutrients and micro-organisms are not returned to the forest. Unfortunately, far too often the ash is simply dumped in a landfill. Returning the ash to the forest means nutrients are not lost from the ground so rapidly, and thus prevents the detrimental impact this has on the growth of the forest. Bio ash has every nutrient needed for the growth of trees, apart from nitrogen. When it is spread, granulated ash settles properly on the ground, not on leaves and branches. Surface waters do not cause the granules to be flushed downwards into the waterways; instead, the granules dissolve slowly into the ground. Ash is a safe, environmentally friendly fertiliser for forests and fields. When the ash composition is within defined values, it does not present a danger to nature, animals or people. Ash will stimulate growth. Ash is an especially suitable fertilizer for example marshy forests, where nitrogen is abundant, but where the soil is too acid and with only small quantities of phosphor and potassium. An annual increased average growth of 7,0 m3 per hectare after ash fertilization. Ash fertilization has a long-term effect. It fertilizes for 30 to 40 years. 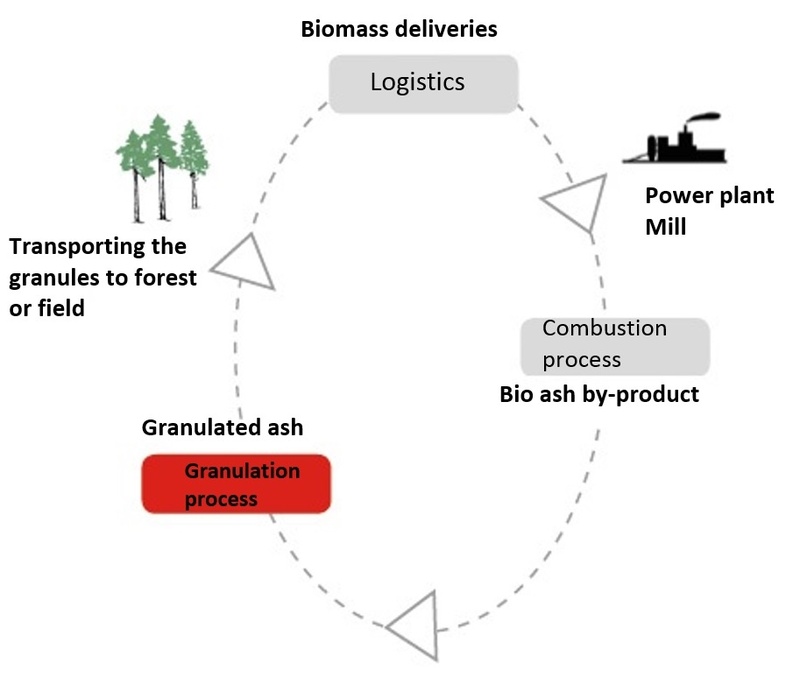 Nutrient content of the ash granule can be tailored according the requirement of the forest soil. Ash granules can be enriched with additional nutrients such as nitrogen. Ash granules are quick and easy to spread on fields and in forests, using the same fertiliser spreading equipment that is used for other forms of agricultural and forest fertilisers. Ash granules can be spread precisely and in a controlled manner in clearly defined areas. The granules do not create a dust hazard and the wind doesn’t easily spread the ash.